, the team at Gardensdirect will supply and lay the garden turf in an efficient and professional manner. Why Artificial Grass? A real lawn can be difficult to maintain with all the pressures of modern living. Artificial fake grass will never need to be mowed or clipped and will make your garden look neat and smart all year round. In winter your real grass lawn will die and wither. If you have some of our amazing artificial grass installed, you wont have to worry about your lawn looking lifeless and unpleasant. We have found that if you have children in your household, getting fake grass is a great idea, because your children will no longer acquire grass stains on their clothing when they have been playing in the garden. 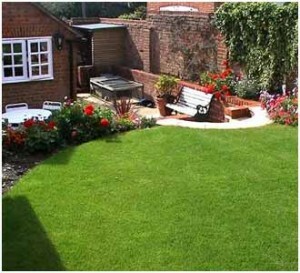 Because you will never need to mow your artificial grass, you can save time and money in the future.